Between now and the start of the season I'm planning on looking back at the performance of various Swans players last season. There are several reasons why I've decided to start with Dobbie. He's one of my favourite players. With Laudrup's recent transfer activity, Dobbie may well soon be surplus to requirements making this piece largely redundant. 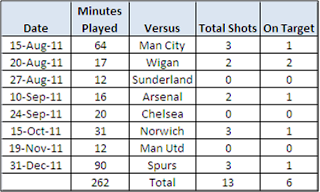 He only played 262 Premier League minutes (over 8 apps) so won't take too long to review! Dobbie started the first game vs. Man City but only played 90 minutes once during the season, which was against Spurs on New Year's Eve. Although not a second-string team in that match, it was largely due to the Christmas fixture congestion that he was given a run out. 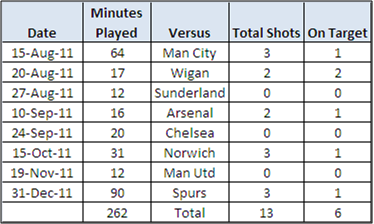 Overall in those 262 minutes, Dobbie managed 13 shots which works out at 4.5 shots per 90 minutes played which although based on a small amount of activity is actually the highest figure of anyone in the squad (Sigurdsson was next highest with 4.2 per 90 minutes then a big gap to Sinclair with 2.9). Dobbie's 'shoot on sight' policy appeared to me to be the work of someone who was trying too hard to do something amazing to try and force their way in to the team. One of his shots from half a mile out against Norwich was a perfect example of that. 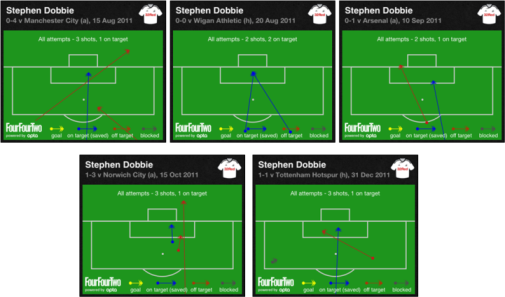 Dobbie's Shooting activity: most from outside the box and some from so far out they don't fit on the chart. My hope is that at the very least he gets a few weeks with Laudrup to try and make his case to stay before the transfer window closes. Ultimately though if Laudrup doesn't think he's up to it you have to respect that opinion. Whenever people talk about loyalty it's always worth remembering the other side of the coin where a club feels that someone can't do a job and it gets to the stage where someone has little choice but to move on.